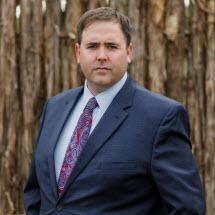 Oliver Neel grew up in Fredericksburg, Texas and returned home to open The Neel Law Firm in 2016. He began his legal career as a defense attorney in San Antonio and then went to work as a prosecutor in Corpus Christi. Oliver Neel was a first chair felony prosecutor at the time he decided to move back to Fredericksburg and open his own firm. Oliver is an adept court-room advocate with years of trial experience before a judge and jury. He is approachable, reliable, and fastidious in legal representation. His civil practice includes real estate litigation, civil litigation, contract disputes, divorce, child custody, and probate litigation. His criminal practice includes representation of those accused of any crime from a class C misdemeanor to a first-degree felony. Oliver has worked on complex criminal cases defending clients of sexual assault of a minor, insurance fraud, family violence, drug charges, juvenile cases, and DWI. He works diligently to ensure that his client's state and federal constitutional rights are not violated. On the civil side Oliver has successfully represented clients in numerous areas including contract, lease, landlord/tenant, partition, easement, divorce, child custody, and probate disputes. His wife, Sara, is also an attorney and joined the firm in 2018.